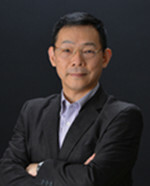 Prof. Kiyoshi Hoshino received two doctor's degrees; one in Medical Science in 1993, and the other in Engineering in 1996, from the University of Tokyo respectively. From 1993 to 1995, he was an assistant professor at Tokyo Medical and Dental University School of Medicine. From 1995 to 2002, he was an associate professor at University of the Ryukyus. From 2002, he was an associate professor at the Biological Cybernetics Lab of University of Tsukuba. He is now a professor. From 1998 to 2001, he was jointly appointed as a senior researcher of the PRESTO "Information and Human Activity" project of the Japan Science and Technology Agency (JST). From 2002 to 2005, he was a project leader of a SORST project of JST. He served as a member of the “cultivation of human resources in the information science field” WG, Special Coordination Funds for the Promotion of Science and Technology, MEXT, a member of “Committee for Comport 3D Fundamental Technology Promotion”, JEITA, and the chairman of the 43rd Annual Meeting of Japanese Society of Biofeedback Research. Dr. Kuo-Yuan Hwa is an associate professor and the director of the Center for Biomedical Industries at the National Taipei University of Technology. Dr. Hwagraduated and received her PhD from the School of Medicine, the Johns Hopkins University. She is the president of the Medical Association for Indigenous Peoples of Taiwan (MAIPT). Dr. Hwa’s scientific interests are: 1) nanotechnology and biosensor, 2) new drug discovery for human diseases by proteomics and genomics approaches and 3) glycobiology, especially on enzymes kinetics. She has published 85 conference and journal articles and 10 patents. She has served in many national and international committees. Dr. Hwa has been invited as a speaker for many academic research institutes and universities in China, Korea, Japan and USA. She has been invited as a reviewer, a judge and an editor for international meetings and journals. In addition, one of her currently works is on developing culturally inclusive health science educational program, with both indigenous and western science knowledge for indigenous children. Prof. Jose Nacher received his Ph.D. in Theoretical Physics from Valencia University. From 2003-2007 he was a postdoctoral research fellow at the Bioinformatics Center, Institute for Chemical Research (ICR), Kyoto University. He was awarded with a JSPS Research Fellowship at the ICR, Kyoto University (2005-2007). From 2007-2012, he was a Lecturer and an Associate Professor at the Department of Complex and Intelligent Systems, Future University, concurrently with a visiting Associate Professor appointment at the Bioinformatics Center, ICR, Kyoto University (2011-2102) and Future University (2012-2013), respectively. From 2012, he was an Associate Professor at the Department of Information Science, Toho University. Since 2016, he is a Professor at the Department of Information Science, Faculty of Science, Toho University. He is a reviewer of more than 30 international journals in his field, serves as an Editorial Review Board of the International Journal of Knowledge Discovery in Bioinformatics (IJKDB) since 2009, as an Editorial Board of the Computational Biology Journal since 2012 and as an Editorial Board Member of Scientific Reports NPG since 2015. Prof. Nacher Lab's bioinformatics research interests include the development and application of novel mathematical methods and algorithms in systems biology and complex biological networks.